Light masts come in different configurations, features and heights. When addressing the third factor, the units must be able to reach certain heights in order to meet the requirements of the project or industrial work site, which could vary between 7 feet and 120 feet – sometimes exceeding such thresholds. By definition, high-mast lighting refers to a mounted lighting system that is at least 98 feet tall. Light towers that are below 98 feet tall are also known as conventional lighting systems. This article explores the benefits and trade-offs of various light mast heights. The second part of the post focuses on applications in commercial and industrial spaces (surrounding light mast height and size). Optimizing light mast efficiency and performance requires implementing a mounting height that maximizes light output and distance. As a general rule, the mounting height of a light tower should be half of the distance across the target area. For instance, if the distance of the work site is 100 feet, the luminary should reach at least 50 feet in height for adequate illumination. This formula is only applicable to lighting systems that emit light in one direction. For dual or multi-head light masts, (using the same example above) it would be possible to deploy a 25-foot light tower in the middle of the site, to illuminate 50 feet of space in both directions, resulting in full illumination of the 100-foot work site. Industrial sites may choose to deploy more than one light mast on the site for greater illumination. For such configurations, spacing between light towers should be four times the mounting height. In application, a business that deploys six, 20-foot light masts should have 80 feet of space between each unit. The effectiveness of height and spacing formulas depend on numerous factors, including vertical/horizontal aiming, lamp performance, lighting technology and beam configuration. For single floodlights, it is common practice to direct light beams 2/3 or 66 percent of the target’s distance. For instance, in areas of 40 feet, the lamp should be aimed at a distance of 27 feet. Glare is a prevalent issue with powerful light towers; and to avoid this, one should not aim the unit over a distance that is twice the height of the mast. For example, a 30-foot light tower should be set at an angle of 30 degrees (minimum, horizontal) and should be aimed no more than 60 feet out (this is only applicable to single-lamp units). 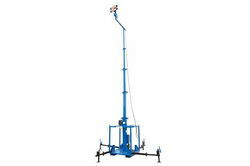 In some cases, the height requirements of a portable light tower are dictated by external factors, such as the applicable environment and work site specifications. At Larson Electronics, our light towers that reach heights of 12 feet are suitable for passing through tight spaces and doorways. Furthermore, our 50-foot Megatower is ideal for oil fields and mining sites that rely on large-scale equipment and structures between 20-30 feet above ground. For commercial projects, surrounding structures, such as buildings, statues and landscaping, should be well accounted for to reduce light obstruction. When working with tall light masts, operators must take wind speeds into consideration. This factor alone could heavily influence the height requirements of the tower. Using data from the National Digital Forecast Database, it would be possible to see that work sites in Midwest and Mideast regions of the US experience generally high wind speeds; while Northern US regions experience generally low wind speeds. The Department of Transportation (DOT) sets forth several unique standards for light tower heights for roadways, which could be applicable to maintenance/repair projects, temporary lighting, construction and permanent pole lighting. According to the DOT, standard light mast poles include: 40’, 49’, 100’ and 120’. It should be carefully noted that the DOT favors the use of 250-watt, 400-watt and 1,000-watt high pressure sodium lamps, though the organization is in the process of incorporating energy efficient LEDs to roadways. The DOT recommends the use of shorter light mast heights when avoiding light penetration/leakage into airport air space. This practice is likely applicable to projects near locations with busy aviation activities. Expounding on recommendations from the DOT, projects around cities are more prone to adhering to lighting codes that limit mast height. From a cost perspective, deploying multiple, short light towers is more expensive than a couple of tall units that are capable of throwing light over a wide area. But when prioritizing uniformity, glare reduction and lighting performance, businesses would be more inclined to using short (multiple) tower configurations. Hence, this could be a reason why some projects call for short light masts, between 25-35 feet in height – despite deployment in wide/large spaces. Remote work sites, such as mining locations and oil fields, may benefit from taller light masts because such locations can get away with high levels of light leakage or trespass. Additionally, less towers on the site equates to minimal space requirements and less crowding.